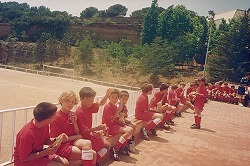 Everybody knows "Soccer (futbol)" is the most famous sports in SPAIN. Compare to when I was in Spain, Liga Espanola is drastically become popular all over the world. That effect is also appeared in Japanese sports TV show too. 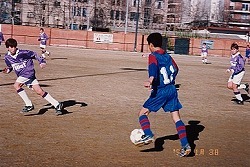 Barcelona city which I lived in, has world's best soccer team calls "F.C.Barcelona". People in town call them "Barca" for the nickname. Barca's biggest rival team in Liga Espanola is "Real Madrid". When this 2 team fights, they call it " El Clasico (The Classic)" and the town will become lively like the festival. Peoples rushed in to the stadium and traffic will down when this match came. Upper picture is views of the seat. When you stand up, you may feel like falling down to the field. This structure provides us like gather their mind to fight with the players. If you visited "Camp nou" which has huge storage of about 110,000 amounts peoples seat, you will definitely become excited and can enjoy the game all night. Lower picture shows the stadium of the "Espanol" which is 2nd soccer team in Barcelona was demolished. Yes this is Spain, they demolished them using by dynamite and blow it just a one second lol. 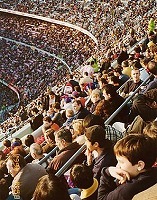 Picture right hand side is the new Espanol's home stadium which was replaced by the Barcelona olympic stadium. 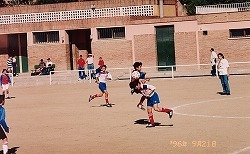 It is possible to say Soccer is the national sports in Spain. They also have massive amount of local soccer teams too. 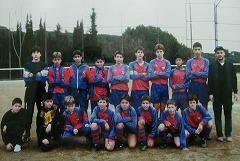 Lower picture which is wearing red uniform, named "Can Caralleu" is my first team I've ever belonged. It's just a kids league, but system was really professional. There are already have division system (for example division A, division B..). Moreover you can check your team and the other teams scorebook on local newspaper too. One year later, I left kids soccer team and I could join regular league team. 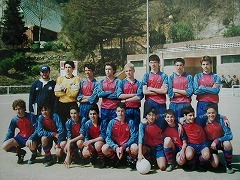 My first club team name was "C.P.SARRIA". And this picture is the first match I've ever had. I didn't even received team socks and pants, but coach choose me for the starting member on that day, and I still remember how I was really happy with it. Team color is red and blue. I liked red color, so I really liked this team uniform. Suddenly all my teammate age went up, so at first I was really hard to play with them, but I could habit with them little by little. Most local soccer club has a BAR near the entrance area, and always parents are drink and taking rest in that place. But sometimes strange drunk guys are talking and laughing each other. 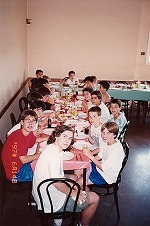 Sometimes we have held gathering lunch like this. And if the yearly league were finished, we held the ceremony and prize the player who got MVP and top scorer etc.. 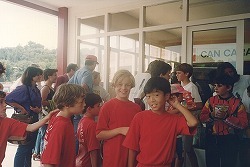 While I was staying in SPAIN for 5 years, there were several times to changing team members. I think this system creates various players because they always play with many different generation and they could learn how to survive with this hard environment. 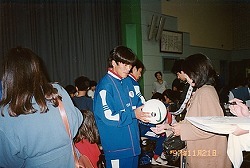 That is why I felt weird most Japanese soccer team is managed by the school team, and always they plays with same guys there. 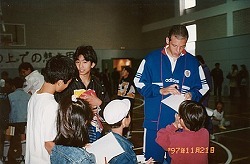 My coach Joldy always gave me uniform number "11 (once)". 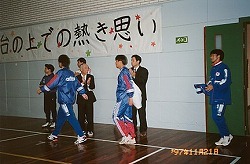 I was mostly right or left forward and I was always pleased to receive No.11 uniform with calling coach's voice "once! 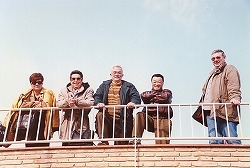 MASA". Spanish club teams prefer 3 forward because of their aggressive tactics. 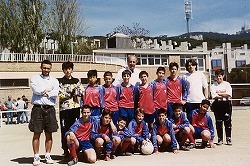 After SPAIN won the EURO championship 2008, I was really happy to proudly say they are "Incredible team"! 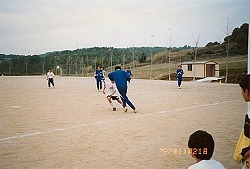 At last we've played soccer game with them in the schoolyard. We played with Japanese school's soccer club members, but of course we couldn't even reach their playing level but I could get 1 goal from them, so that was really satisfied for me. 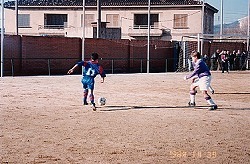 In Spain, I felt there is always soccer with every daily life. Strange drunk guys are always talk about soccer, and even if their local soccer team is weak, they always cheer them ardently and really love them. And I felt team mate closer same as like as a family. I think Japan also can improve their soccer skills when they expanded their club team environment more, and if they started to play with several generations.